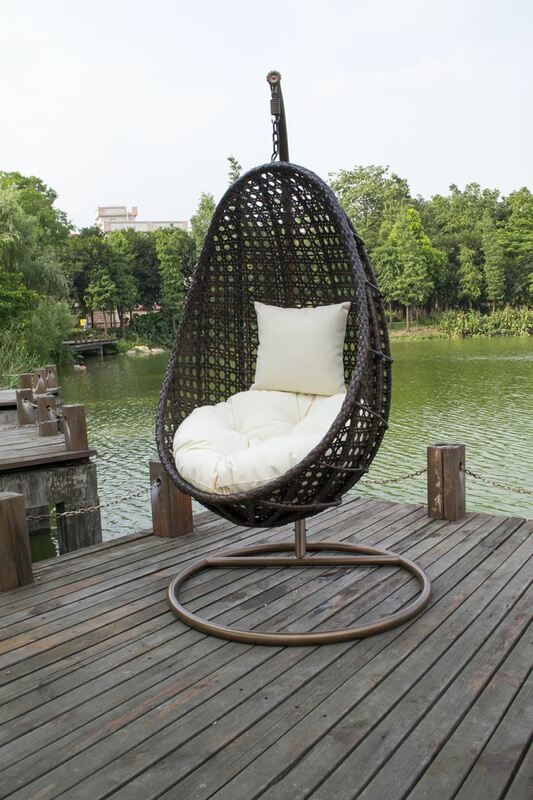 When hanging out tops your to-do list, choose Wicker Hanging Egg Chair With Cushion And Stand. Made to seat just you, this Tanfly company offers a luxurious space to relax and unwind. The frame is wrapped in resin wicker and hangs securely from a durable steel stand. Sturdy yet stylish, this chair holds up to 300 pounds. Offering up serene coastal-inspired appeal, the resin wicker weave in clean brown creates a perfect filter for fresh breezes. Walking by without giving this chair a try isn’t an option, as the comfy, tufted cushion, available in your choice of polyester fabric colors and frame color. With its range of subtle colours and tones, it effortlessly blends into your patio for a contemporary, space-conscious, style. This Tanfly outdoor swing chair is a colorful addition to any backyard or deck. Featuring brilliant brown synthetic wicker and a bright white cushion, relax in comfort while adding style to your outdoor space. Whether you’re enjoying a book or taking an afternoon nap in the shade, the Tanfly is a perfect choice.